Libra girl pleases her parents with her calm, balanced character. Has an intuitive instinct that prompts the right decision in any situation. Amazingly kind and sympathetic girl easily finds a common language with people. He enjoys popularity among peers, maintains relationships with countless friends. For them she is a pleasant companion, a good friend. The girl-Libra is distinguished by a rare prudence, strives to arrange life in the best way: without worry and anxiety, in complete harmony with herself. It shows extreme independence in matters, although it is in doubt, but skillfully copes with its weaknesses. She prefers to trust his inner feelings, and will not get involved in questionable matters. She does not like noisy games, she is more interested in girlish joys: dresses, jewelry, toys. Libra — a symbol of stability, justice, balance. The representative of this sign from early childhood has diplomatic abilities. She knows how to settle any conflict, reconcile the warring parties. If necessary skillfully uses flattery, differs a rare talent — like everyone. Sincerely rejoices at every kind word, gratefully accepts any help, appreciates loyal people. Can forgive deception, but will cease to trust, is distinguished by a heightened sense of justice. The Libra girl has an accommodating character and prudence. At the same time, she often doubts her own strength, she needs help and support from a strong person. With age, natural ambition is becoming more vivid, the girl can significantly advance along the career ladder. She tries to avoid work associated with manual labor, the recommended profession: a lawyer, an auditor, a teacher, an architect. A girl from a diaper shows herself as a reserved, balanced person. 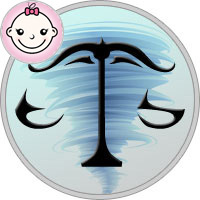 Children are sensitive to an unfavorable emotional atmosphere, but not the representative of the air sign-Libra. Usually a well-disposed girl almost does not cry, does not pester caprices. It shows miracles of diplomacy, tries to smooth out any unpleasant moments. Prefers to lead a quiet and measured lifestyle. She likes quiet games, can spend hours playing around with his dolls or watching aquarium fish. Libra — a symbol of harmony, from an early age the girl tries to find inner balance. She works a lot on herself, the most favorite pastime is reading. Considers that the appearance should correspond to the internal filling. Has a delicate taste, always looks perfect. She adores luxurious clothes and ornaments, her room is a real girlish kingdom. The girl-Libra is pleased to visit art galleries, exhibitions. The contemplation of beautiful things gives her aesthetic pleasure, this is the best way to find peace of mind. The Libra girl is soft and kindhearted. She tries to help everyone in trouble. An impressionable person takes his sorrows and misfortunes to heart, and can burst into tears of compassion. Thinly feels the state of mind of the surrounding people. Her love is enough for everyone, especially caring for animals. She will not pass by a helpless creature, she will certainly pick up a bird with a broken wing and take it to a veterinary clinic. Will carefully look after, carefully following all the doctor’s recommendations. You can not doubt that her pet will completely recover. Libra girl differs calm tranquility, it seems that she is circumvented by all the worries and worries. Parents can not guess about the experiences of their daughter, she is radiant with joy and love for everyone. For her, the main thing is the favorable atmosphere in the family, so she tries not to show her fears. Surrounding people believe that the girl is devoid of ambition. The baby is quietly engaged in their own affairs, while he is very ambitious plans. She strives to get a good education and to take part in the profession. It does not attract boring work, which takes a lot of effort. Much better looks the scope of activities related to art or intellectual work. The grown-up girl will necessarily take the position of leader or become a fine professional with a high salary. Baby-Libra - the ideal child, parents are proud of their quiet daughter. The girl is happy every day, showing a cheerful nature. She enjoys playing with children, always shares toys with them. The obedient little one does not cause trouble and trouble, it deserves the praise of the parents. Needs an affectionate and caring attitude, words of approval give her strength. In school years the girl-Libra shows her best qualities: calmness, goodwill, diligence. Teachers are always praising the diligent student, classmates are drawn to a sympathetic and kind girl. Excellent in all subjects, but sometimes lazy. She does not like to overcome difficulties, child prefers to avoid them. A girl can come up with a good reason not to participate in cleaning the class. She has uncommon artistic data, parents must necessarily write it to the theatrical circle. In adolescence, always an easy-going girl can show signs of discontent and irritation. Differs amorous, constantly dreams of novels. Parents should not blame her for lightheadedness, gross interference with her private life can cause aggression. The girl tries to restrain her indignation, but internal tension negatively affects the cardiovascular system. Over time, there may be heart problems, besides, the lumbar region deserves attention. The Libra girl is so prudent a child that she does not need the increased attention of her parents. Itself can make the right decision, you just need to push it a little to the right choice. It is too hesitant, does not like to overcome difficulties. Parents should praise it every day, pay attention to excellent qualities: kindness, responsiveness, patience.